Face it, Chicagoland is a BIG place, covering hundreds of square miles. How to navigate it all and find the shopping and services you’re looking for? If you’re lucky enough to own a car, you can go and come as you please. There are many places to shop for new and used cars, trucks and SUVs throughout Chicago. If you’re planning a new or used car purchase, FindmeChicago.com should be part of your search. Owning a vehicle takes more than just putting gas in it every week and keeping up with your car keys. 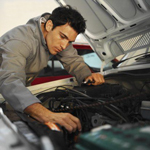 Every so often, your vehicle will need the services of a good mechanic, a speedy oil change or a new muffler. And since we like to ride in style, a good car wash that puts that new car shine on the fender again is crucial. This is the category on FindmeChicago to find mechanics, oil change garages, transmission shops, auto-body and collision repair clinics, tire and muffler shops, and auto parts supply stores. Keep your vehicle in tip-top shape with information on shops close to you, from FindmeChicago.com.